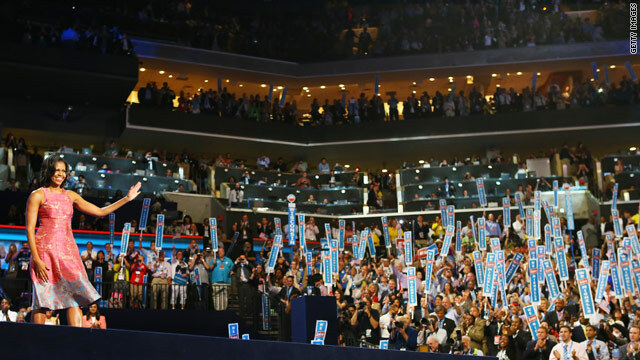 (CNN) - The Democratic National Convention released the remarks prepared for Michelle Obama to deliver at the DNC convention in Charlotte, North Carolina on Tuesday evening. It seems you only allow favorables commentaries... bad CNN, bad. The best convention speech I've ever heard from a First Lady. Well written and well said. Mrs. Obama has really grown into the role. Hopefully her Let's Move campaign and work with nutrition and school meals will be her legacy with long-lasting, effective change to the health of American children. "Ari Fleischer, sounding a bum note said, "some speeches are much more effective in a hall of zealots." Poor Ari. Still pretending he is relevent. Michelle must have bruised his ego. Without a doubt, Ari of all people understood the message behind the message. She was absolutely brilliant. If she wants to leave a better world for her daughters, she should fire her husband. I was a huge supporter for the president, but unfortunately he didn't keep many promises he made and this economy has hit our life so hard. I totally agree President Obama is a very good, decent person. But, for the position of the U.S. president, I prefer to have somebody who is competent to do the jobs rather than a good person. You don't have much heart do you , the kind of heart that comes with commitment , strength and time. If you truly supported him then you would support him now more then ever. So I take you past support with a grain of salt . You republicans would rather have a corrupt dictator then a good honest person if I'm reading your last sentence right. Mrs. Obama's speech was full of lies. First, she indicates they were poor when they married, but yet they went to Ivy league schools. Then she indicates that Barack's mother was poor, when she was vice president of a bank. So, he was not poor. How much did the dress she came out to make this 'speech' cost? People have describe Mrs. Obama as a class act. How much of a class act is she when she indicates it is the government's role to create jobs and fulfill people's dreams, when the government is the most inefficient wasteful organization that there is? Plus in her speech, she sshe 'loves that he never forgot how he started?' Yes, when he was smoking weed and cocaine. When he WASTED the entire stimulus on an economy with NOT ONE job created!! Where are all the jobs Barack??? The big three?? There were better ways to deal with the big three then that massive toilet flush you called a stimulus. Notice that in everything Michelle said not once did she say the government helped her or her brother realize their dreams. All the speakers said it was their hard working parents that got them where they are, not the government. Michelle's dad had to pay a tiny portion of the tuition. Great points Michelle made all referencing her dad and mom, not one point references that our government made it happen for her or her brother. Castro also in his speech did not say the government did it for me, it was his mother. Your being trifle and silly ! Government by the people and for the people. What's your motto , Corporations are people too , until they don't need you ? Wow.. This speech is so beautiful. It speaks to all American. I'm glad no one was around when I watched this;I was moved to tears. "It's not about how much money you can make ... It's about the difference you make in people's lives." And I quote... "But at the end of the day, when it comes time to make that decision, as President, all you have to guide you are your values, and your vision, and the life experiences that make you who you are." Values and Vision? Sounds like a STRONG endorsement for Mitt Romney. Surprising Michele Obama would bring that up. Good speech Mitchel. But I am not too surprised. You are a seasoned and highly intelligent lawyer. blown away. just amazing. American people should be proud and grateful to have her on the front line. Well done you, Michelle. Our love and supports from Indonesia. Great job Michelle! A class act...very moving speech. OMG.... Amazing....... I am just speachless, beautifull speach,from the heart. This speech is so overpowering and so emotional. She really reaches out to each and every American, Democrat or not. She doesn't sound like she's trying to get the President win the reelection, she sounds like she's praising her husband. This speech is absolutely amazing. Thank You Michelle. Well said , Well Dane. Keep moving forward and we are with you. If she wants to leave a better world for her daughters, she should fire her husband. I was a huge supporter for the president, but unfortunately he didn't keep many promises"
I am sorry that you feel Mrs. Obama need to fire her husband because I think we need to fire all of th people who stood in the way of the president you know the ones "we will every thing in our power to make President Obama a one term president." Now the other side is lying to boot. Are you sure you are looking beyond his skin. Fantastic, awesome,exhilarating, inspiring speech by First Lady Michelle Obama. Will definitely vote for President Obama this year for four more years. America continue to pray and support our President Obama and vote for him in November. God bless President Obama and Michelle Obama! This is a re-election campaign for Barack and Michelle Obama. It's this convention suppose to sell us on what they have done and why it's going to make things better. Michelle's contribution to the last four years has been health. She has tried to get a 4.5 billion dollar change in school lunches to make them healthier. Why wasn't anything mentioned about this?